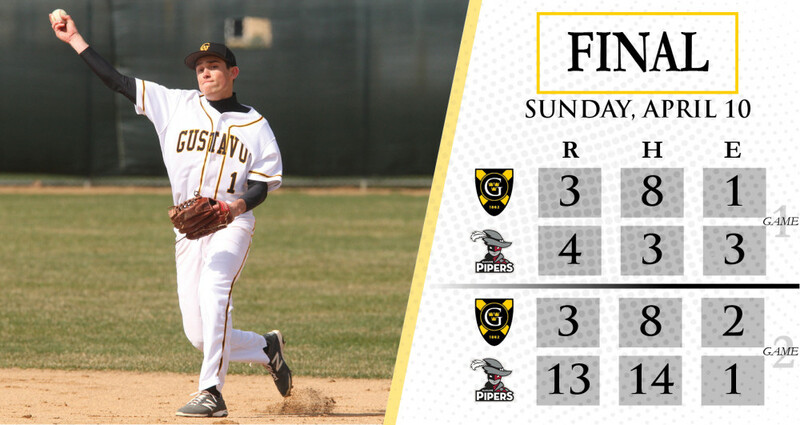 ST. PAUL, Minn. – The Gustavus baseball team was swept by Hamline on Sunday at CHS Field, dropping the first game by a slim 4-3 decision, followed by a more convincing eight-inning 13-3 loss in the second game to move to 8-10 overall and 1-3 in the MIAC, while the Pipers improve to 14-8 overall and 4-2 in the league. Every inning was scoreless except for the fourth where Gustavus started the frame with three runs, but Hamline answered in the bottom half with four, which held for a 4-3 final. The Gusties put up their trio of runs on just one hit and took advantage of three Piper errors. John Lundquist (So., Rochester, Minn.), Danny Kimlinger (Sr., Lindstrom, Minn.), and Brock Peterson (So., Cannon Falls, Minn.) all scored in the inning, while Cody Christensen (Sr., Luverne, Minn.) registered the only RBI on a fielder’s choice. The Pipers responded with their four runs on three hits and one error. Adam Stockwell’s (Fy., Apple Valley, Minn.) day on the mound ended with one out in the fourth. He allowed four runs on three hits with one strikeout and three walks. Casey Lewandoski (So., Fairbanks, Alaska) came in relief and finished the final two and two-thirds innings without allowing a run or a hit with one strikeout and zero walks. Isaiah Welckle (Jr., Minneapolis, Minn.) and Sam Warner (Sr., Chanhassen, Minn.) led the Gusties at the plate, each batting 2-for-4. The second game started well for the Gusties as they took a 1-0 lead in the first inning, but the Pipers responded big time in the bottom half with seven runs and never looked back. Sam Carlson (Jr., St. James, Minn.) had a rough start on the mound, giving up four earned runs with one home run and three walks in one-third inning. Jacob Braun (Jr., Wayzata, Minn.) entered the game in relief and lasted three and two-thirds innings. Braun allowed two earned runs on six hits and one walk. Sam Archer (Fy., Zimmerman, Minn.) and Kyle Pinke (Jr., St. James, Minn.) also saw time on the bump. Archer went one and one-third innings with two earned runs on three hits, while Pinke pitched two and one-third innings with two earned runs on four hits. Welckle once again led the Gusties at the plate, hitting 3-for-4 with two runs and a double. Dan Carlson (Jr., Plymouth, Minn.) also had multiple hits, batting 2-for-3 with one run, an RBI, and a walk.